It’s early November, and I’m lying flat on my back in the We Got This Room at the TB12 Sports Therapy Center in Foxborough, Massachusetts. Outside, in the shadow of Gillette Stadium, the Patriots are practicing for that weekend’s game against the Seahawks. Every space in this 7,500-square-foot complex has its own theme: the Grit Room, the Determination Room, the Perseverance Room. Indeed, with everything from branded water bottles to neatly arranged rows of organic snacks and energy bars, TB12 feels more like a high-end spa than a training facility for ferocious football stars. The We Got This Room has a wall-to-ceiling photograph of a rock climber hanging off a cliff, and I start to think it’s someone’s idea of a joke to put me in here. Five weeks ago, I shattered my heel in a bouldering fall. I had just returned home from a grueling seven-day race across the Alps and was climbing at an indoor gym — the kind that sells protein bars for $7 and hosts birthday parties for fifth graders. I was 12 feet off the deck when I lost my grip and fell, the full weight of my body coming down on my left leg. My foot was crushed like a soda can. In the emergency room, I learned that I’d fractured my heel bone — an injury infamous for its long-term complications, like death of bone tissue that, in extreme cases, can lead to amputation. My surgeon warned me that I shouldn’t expect to perform at the athletic level “to which I had become accustomed.” He used three screws to piece my heel back together and ordered me not to put weight on it for at least three months. But here I was, five weeks later, feeling like an imposter in a facility filled with elite athletes, about to walk. Guerrero’s methods are unconventional, to say the least. And yet he’s become some­thing of a legend in the sports world. NFL stars from Wes Welker to LaDainian Tomlinson have trusted him with their livelihoods. Julian Edelman once referred to him as Mr. Miyagi. Danny Amendola calls him a wizard. 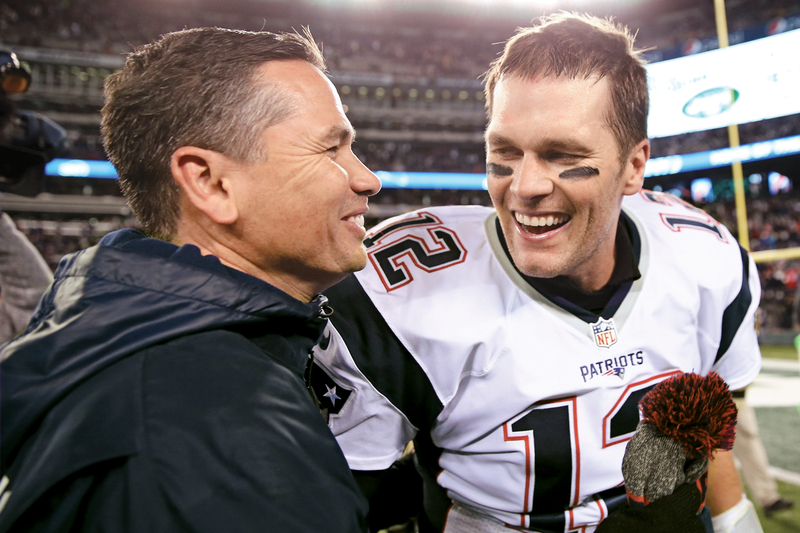 And no article about Tom Brady is complete without a few paragraphs on Guerrero and an attempt to describe his relationship to football’s greatest quarterback: trainer, nutritionist, counselor, spiritual guide, massage therapist, and godfather to Brady’s youngest son. The two met more than a decade ago, and in 2008, when Brady blew out his ACL, it was Guerrero who worked him back to health in record time. Brady and Guerrero have been inseparable ever since, with the 39-year-old crediting his athletic longevity to the trainer. In 2013, the two rented space from the Kraft Group, owner of the Patriots, and opened the TB12 center to provide mere mortals like myself with access to their weirdly effective methods. My first appointment, three weeks after surgery, began with an extensive interview: How much was I sleeping? What was I eating? Was I meditating? Within a few minutes, Guerrero began making recommendations: triple my water intake, wear a bioceramic recovery sleeve (a compression sock designed to increase thermal activity and stimulate blood flow) while sleeping, and take high doses of calcium and vitamin D.
Then he sent me home. That was it. I had no clue what meditating had to do with my heel or how drinking more water would help get me back in the mountains. I suddenly wondered if the criticism I’d read about Guerrero might be true. For years he’s been dogged by accusations of endorsing shady supplements and palming himself off as a doctor. Was he simply a new age charlatan? Still, I was buoyed by the fact that Tom Brady’s personal trainer was coaching me, and given Guerrero’s client list alone, how could I not trust him — at least for now? “G,” of course, is short for Gisele — as in Bündchen. Sheepishly I crutch my way past her, and Guerrero leads me to a machine that looks like a treadmill covered in a small greenhouse. “It’s an antigravity treadmill,” he explains. “It’s time to start retraining your neuro-patterns.” He straps me into the apparatus and begins pressing buttons until the greenhouse fills with air and I’m floating above the treadmill, bearing just 10 percent of my body weight. Guerrero explains that when I fell, my brain noticed. Instantly, new neural pathways were created, sending signals to my body that my heel was now out of commission. Using my heel, even in a small way, starts to re­program those pathways. It challenges my body to keep my muscles supple, to reduce the swelling, and increase my range of motion. Still, I’m terrified of reinjuring myself, becoming crippled for life. Part of me wants to beg Guerrero to let me lie down and elevate my leg. Then again, I’m damned sure not about to look scared in front of the world’s most famous supermodel. So slowly I move my foot forward and begin walking. Alejandro “Alex” Guerrero grew up in California and studied traditional Chinese medicine at the now defunct Samra University in Los Angeles. In 1996, he opened a rehabilitation practice in L.A. and began working with track athletes. After noticing runner after runner suffering from the same recurring hamstring injury, Guerrero decided to watch how they trained, hoping to gain insight into why they were so vulnerable. What he learned became the foundation of his philosophy. “I realized that what they were doing in the gym and what they were doing on the track were worlds apart,” he says, pointing to gym routines with heavy weights that create short, tear-prone muscle fibers built for quick bursts. “You can’t do weighted squats one day and then the next expect to be fast and nimble in the other direction.” This marked the beginning of Guerrero’s obsession with conditioning to avoid injury, a trademark of TB12 culture that’s designed to “sustain peak performance,” its website says. Three times a week, I drove to TB12 to work with Guerrero and his team. Each session was two hours long, and I would often see Patriots like Brady, Julian Edelman, and Rob Gronkowski whisked away into one of the private treatment rooms. If they trusted Guerrero, I thought, why shouldn’t I? One-on-one, Guerrero is incredibly calming — old-fashioned, even. He is a family man, quick to smile, and someone who moves intentionally — tilting his head to one side, choosing his words carefully. In almost every session (they cost $200 a pop), I was analyzed on a series of machines that checked my load distribution and biomechanical efficiency. 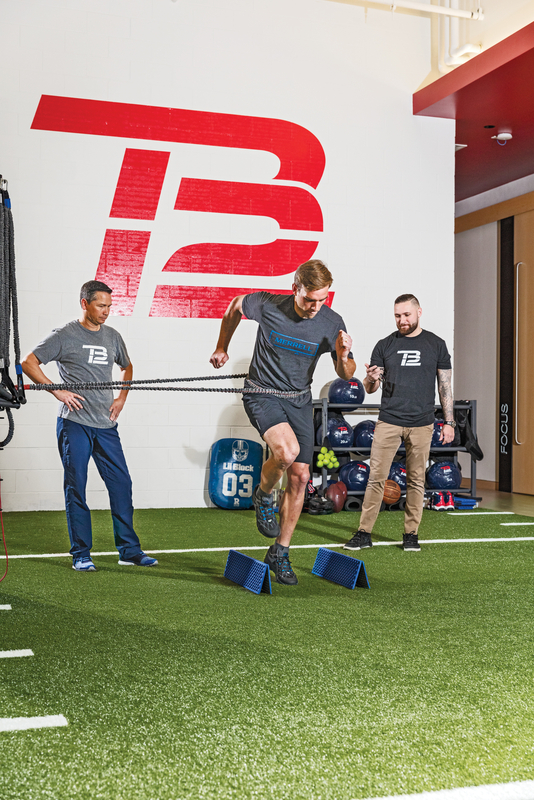 I worked with resistance bands — both at TB12 and at home — to maintain strength and minimize atrophy. Guerrero believes that we can’t let our bodies dictate what we can or can’t do. Before I could get my heel to start recovering, he explained, I needed to convince my brain to “reclaim” it. Everything I did, from deep-tissue massage to accelerated weight bearing (the antigravity treadmill) was seemingly designed to send a message to my heel that it was still a part of the team and needed to get off the bench. Outside of the ancient rituals and a near-religious belief in the mind-body connection, Guerrero’s approach to training can be broken down into three areas, all of which are interconnected at all times: prehab, rehab, and nutrition. Prehab is about muscle pliability. Much of his work prioritizes creating muscles that are long and soft: You won’t find anyone at TB12 lifting weights in a way that feels “nonfunctional” to Guerrero. Instead, his athletes train at high intensity using resistance bands and body-weight exercises — single-leg box jumps, lateral band walks, shoulder resistance-band circuits, and virtually every plank variation. The nutrition component to Guerrero’s model was the most difficult aspect of the program for me. Much of the focus is on getting the body’s acidity and alkalinity in balance. This is where the food diary came in, and while I like to think of myself as a healthy eater, I struggled to drink 100 ounces of water a day and avoid white flour, sugar, caffeine, dairy, salt, and the inflammation-causing axis of evil: peppers, mushrooms, and tomatoes. To Guerrero, diet-induced inflammation may as well be the eighth deadly sin, and he did everything he could to eliminate those foods from my life. Instead of my daily cup of coffee, I switched to a substitute made of barley, rye, and various other sticks and twigs. Every morning I forced myself to drink the vile stuff until I eventually caved and had a coffee at lunch. Afterward, I felt guilty. Even with Guerrero behind me, it was a constant struggle. One moment I’d be hopeful, thinking I was progressing, and then the very next, I would buckle from the searing pain of simply trying to stand. Guerrero was quick to praise any small progress. Within a few sessions, I started to notice improvement in my foot — I had less pain and more range of motion. But I had yet to tell my doctor. At my 10-week checkup, I was terrified of showing him how I’d already been walking. His reaction to my mobility was one of disbelief. “In my 25 years of practicing medicine, I have never seen someone recover from a calcaneus injury this quickly,” he said. Squinting at the X-rays on his computer screen, he asked about Guerrero, trying his best not to sound too interested. I kept my answers vague, partly because I was still not entirely sure how Guerrero worked his magic and partly because I felt bad for breaking my doctor’s orders — as if I’d had an affair. Over the next weeks and months, Guerrero helped fine-tune all aspects of my health, and his methods opened up a new way of understanding myself. I now approach my training with a new emphasis on attending to my body before and after the performance. Prior to my time at TB12, I hardly ever stretched. Now I do it all the time and really mean it when I tell people that working on pliability is just as important to me as working on strength and endurance. I think about my health not just when I’m training, climbing, or running, but when I’m eating, sleeping, and stressing. I think about warming up my spine before I begin my run in the morning. I meditate using an app called Headspace on my phone before bed. I know that to really speed up, as Guerrero often explained to me, I have to slow down. Ten weeks after my injury, I was making my way up the last pitch of New Hampshire’s Black Dike. It’s a classic ice route that I had always wanted to climb. On the drive up that morning, I almost turned around numerous times, worrying that my recovery was too good to be true, that something was bound to give. But once I started climbing in the crisp mountain air, I felt my confidence return. At the top, I scanned my body for pain and realized just how much I’d been holding my breath throughout my healing process, waiting for the other shoe to drop. A few weeks later, after orchestrating the greatest comeback in Super Bowl history, Tom Brady fell to his knees, a swarm of cameras engulfing him. Watching from my living room, I felt the adrenaline, too. But it was the smaller man, crouching down next to Brady, whose reaction I kept trying to see.